New procedural PVE content has been introduced into EVE Online in the form of NPC Mining Operations. They are appearing across New Eden in asteroid belts. If you are searching for them you can use the d-scan and even combat probes to find them in systems. The NPC miners & reinforcements have a special name format with a diamond in them to make it easy to spot them on overview or on directional scanner. Format is generally the name of the NPC Corp, a diamond symbol then what ship type. They also have standing colors which will reflect in the overview based on your current standings of the NPC Corp the mining group is apart of. NPC Mining groups appear in mining frigates, barges or in exhumers. Haulers will warp in to pick up ores from the group when they are almost full. You currently cannot scan ore cargo holds with a cargo scanner. Asteroids will also deplete and be removed from the belts if mined out by the NPCs. 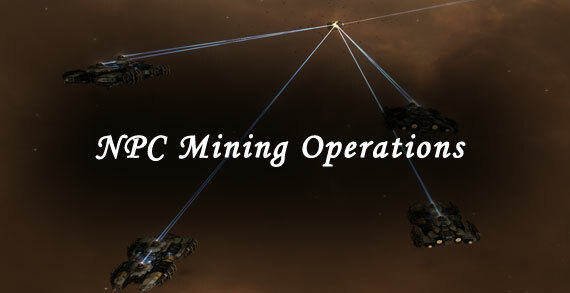 If you attack or have negative standings towards the NPC Miner group they will call in reinforcements. Reinforcement fleets are also dynamic and can be a variety if ships and hull types. Generally there are 3 different pack types for reinforcements. NPC AI is also improved to make the NPCs more pvp reactive and follow certain range distances. For instance the healer types will trail behind the rest of the fleet, healing at max range. Destroying a miner ship, they will drop whatever mining ores they were busy mining before you attacked and blew them up. If you wait for the hauler ship, they have a chance to drop a strong box and also will drop any ores they picked up from the miner fleet. Note: You need to wait for the hauler to go to each of the miner ships in order for the hauler ship to have ore in it. Also the hauler will warp out when its finished picking up the ore, make sure not to wait to long! Strong Box’s are similar to loot crates you find in other games. As you open up the box, you will receive one skin and on rare occasion a factional item or storyline bpc. Haulers take longer to show up if the miner group is a pack of ventures. Tech one haulers have no warp core defense, while tech two have +2 so make sure you have the correct number of points in order to prevent the haulers from getting away. Barges / Exhumer time frame of hauler showing up around 30 minutes to one hour. Venture time frame can be well over a hour to two hours. Tech one haulers can be solo ganked in high dps ships like stealth bombers, T3Ds before reinforcements show up. Basically you gank the hauler, bookmark the spot then warp out and back in after a couple of seconds. Another strategy is to wait for the hauler to show up, attack it and warp out. Then use a combat probe scanner to see where the hauler, miners and reinforcements warped to in space. Use a long range kite ship to destroy the reinforcements. I’ve been using a Ishtar which works great for just this sort of a thing. Once you destroy the reinforcements you lock down the hauler with warp scramblers and destroy it.